Posted by Eddie & filed under Books, Mountains & hills, Science, April 23 2007. Ever since my first real mountain walking trip, to the Cairngorm plateau, I have been fascinated by the idea that in Scotland there can exist at high altitudes, even in the summer months, a small portion of the arctic. 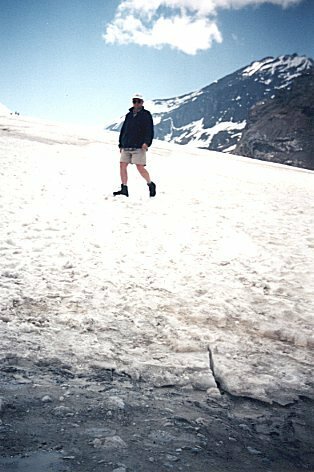 This trip was in June 1983, and the Cairngorm plateau then truly was arctic in nature, with very large permanent snowfields. Now, in 2007, things seem different – see my previous posting ‘Has climate change already affected hillwalking in Scotland and further afield?‘ and this Independent newspaper article from December 2006. As I’ve learned more about the Cairngorm mountains and Scotland’s geological history, glaciers have come to be a bit of an obsession with me. Part of it I think, is the idea that their marks are everywhere on the Scottish mountains, but the glaciers themselves are conspicuous by their total absence. It seems somehow that the Scottish mountains are missing a component of what makes them dramatic and scenic. Photographs of ice-covered mountain ranges in other countries only make this absence more keen. The appeal of glaciers is also in their natural beauty and scale and they seem to almost be alive as they brood in mountain corries, slowly changing the mountain landscape, and swallowing unwary mountaineers in hidden crevasses. Walking in a mountain environment that contains the hazardous beauty of glaciers is a true adventure and spectacle. Scotland is tame in comparison. The first glacier I ever visited was the Athabasca Glacier (photo) in the Canadian Rockies. This glacier is easily accessible (you can drive close to it on the Icefields Parkway in Jasper National Park, which I’m hoping to return to this June) but I have since been to more inaccessible glaciers in Norway, namely Styggebreen (near Galdhøpiggen – photo), the Snøhetta glacier (photo) and Kjenndalsbreen (photo). 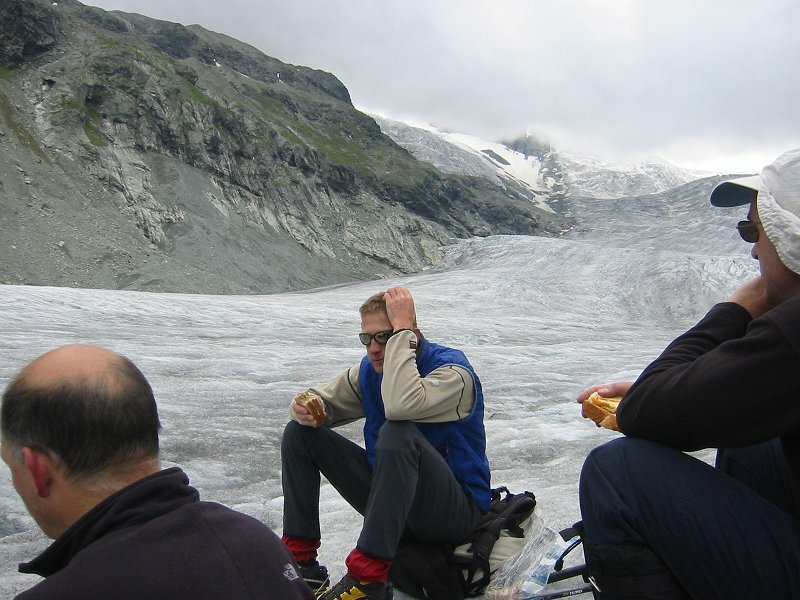 I have also done some guided walking on the Glacière de Ferpècle in Switzerland (photo). The mountains in Norway in many ways look similar to Scottish mountains, so to go walking there gives one a good idea of what Scotland used to look like. Indeed, the mountains there have a similar climate to Scotland and are only a little bit higher in altitude and latitude – and a tantalisingly short airline flight from the UK can transport you into a surrogate Scotland with an extra glacial dimension. 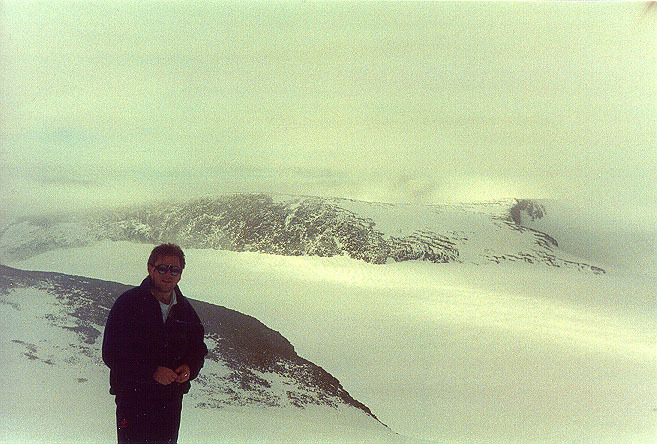 As I noted in my previous posting ‘Has climate change already affected hillwalking in Scotland and further afield?‘, I also still harbour an ambition to see the glaciers on the summit of Kilimanjaro – although a BBC report last week stated that some scientists believe that the prevailing theory that this glacial ice will disappear before 2020 may well be wrong. Seeing glaciers in the mountains for real and up close has made me feel even more that walking in the Scottish mountains, especially the glaciated environment of the Cairngorms, is in some ways a bit odd. Glaciers are an unspoken, invisible presence, but their absence is tangible and ghostly. Scottish glaciers can seem tantalisingly close, perhaps more so than some people realise. Permanant, year-round (or ‘perennial’) snowfields give birth to glacial ice, and there used to be several of these in the Scottish mountains, particularly in Lochaber and the Cairngorms. There’s an interesting discussion about this in the book ‘Scotland’s Winter Mountains‘ (now out of print). I have vivid memories of visiting the large permanent snowfield in Coire Domhain on the main Cairngorm plateau on that walk in June 1983, and also of seeing large patches of summer snow in An Garbh Coire from the summit of Braeriach in September 1994. According to some geological and historical evidence, there may even have been some glacial ice in Scotland (presumably in the high corries of the Cairngorms) as recently as the late 17th century. 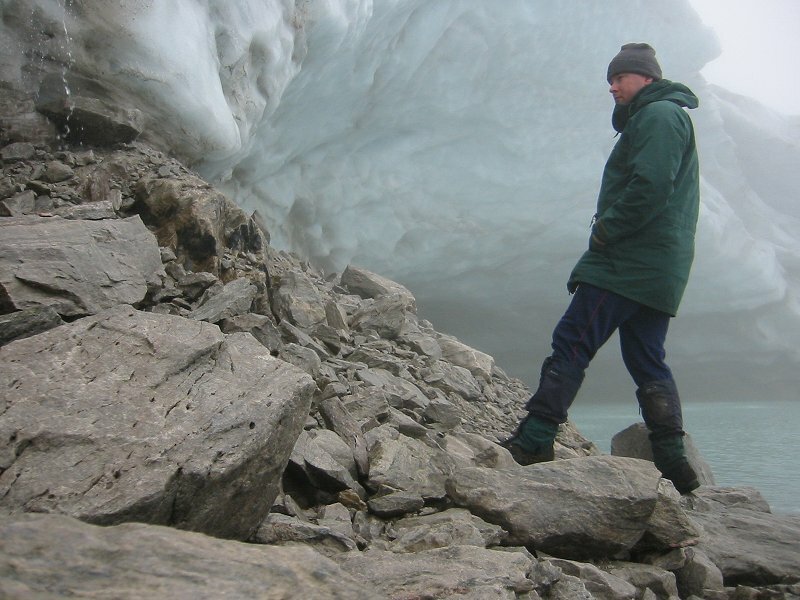 The altitudes at which glaciers can exist in Scotland is only a few tens of metres above the highest points in the Cairngorms (around 1300m above sea level), and a climate swing of 1 or 2 degrees centigrade would cause glaciers to start forming again – although of course current climate change seems to be going in the opposite direction to that required. I’ve always thought that the relatively obscure St. Mary’s Glacier in Colorado is a good example of what a potential Scottish glacier might be like. This feature is halfway between a permanent snowfield and a true glacier and the equivalent in Scotland would only take a few years to form. 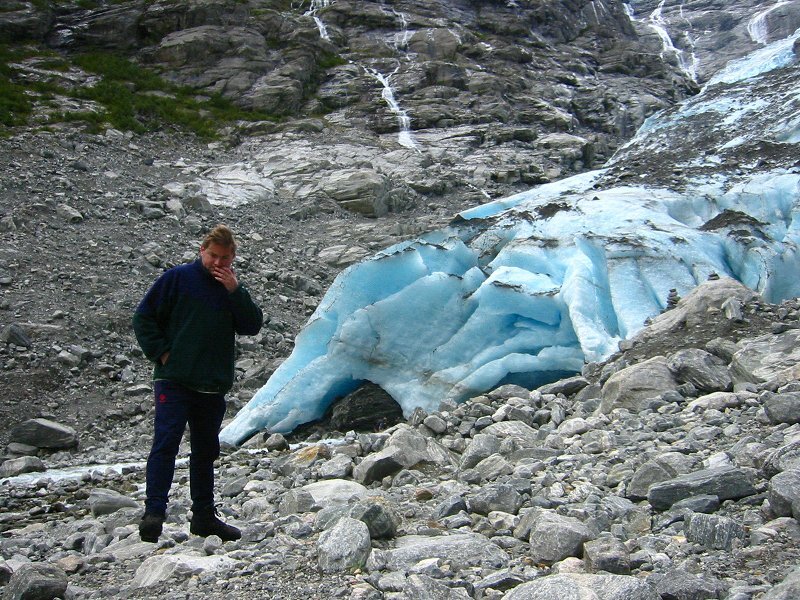 These pictures of the glacier from Oct 2005 show that the ice is only just permanent. The Colorado Rockies are perhaps surprising in that they only contain a few small glaciers (the Arapaho being the largest at only 0.24 km2 in surface area) despite having altitudes in excess of 4000m, presumably due to the latitude. In my lifetime, indeed over the last ten years or so, the permanent snowfields in the Scottish mountains seem to have essentially disappeared. Whenever I go walking in the Cairngorms, I always look closely to see how the high plateaux and corries are clinging on to their icy arctic environment (see my previous posting ‘Maiden Scotland and Geal-charn Mor‘), but it seems that the prospect of glaciers returning to Scotland is incredibly remote at the moment. I still can’t help holding out a perhaps forlorn hope though. Interesting thoughts Eddie. The Cairngorms mountians certainly are a place where the effects of a changing climate are, and will be, very obvious. The Board of the National Park Authority were considering this matter only last week (20 April 2007). See link below. You might also be intersted in this other excellent site about the Cairngorms landscapes. This conclusion is drawn by analysing lichen cover on rocks in the Cairngorm corries. So it appears that the claim that glacial ice existed in the Cairngorms as recently as the 18th century may be unfounded. RAPSON, S. C. (1985), Minimum age of corrie moraine ridges in the Cairngorm Mountains, Scotland. Boreas, 14: 155–159. This paper argues that ‘active ice’ cannot have existed in 3 corries with boulder moraine ridges in the Cairngorm mountains since 6000-9000 years ago, as organic sediments retrieved from the lochs in these corries have been radiocarbon dated to those dates. There is some scope here for further research though – an implied assumption has been made in this paper that ‘active’ glaciers, if they existed, would have completely disturbed or removed any trace of organic material in the corrie – but how true is this assumption? Also, only 3 corries out of 30 in the area of the Cairngorm mountains have been investigated with these methods in this paper, because ‘only a handful hold boulder moraines’ – but again, how true is this? Coire an t-Sneachda certainly contains small moraine ridges (http://www.landforms.eu/cairngorms/coire%20Sneachda.htm), but is not mentioned at all in the paper, and I am sure there are others. Interestingly, the paper does say that the corries may have contained ‘permanent snow’ during the period of the Little Ice Age but again, we’re back at the issue of definitions and labels that I touched upon in my more recent blog entry ‘The Scottish mountains: on the glacial ‘knife-edge‘. Sheila Rapson summarised the research she did on a few of the Cairngorm corrie moraines in a Scottish Mountaineering Club (SMC) Journal article published subsequently to her 1985 paper (cited in the previous comment) in 1990. In it, she points out that there are 18 coires in the Cairngorms (including the Lochnagar massif) that hold moraines, but that her radiocarbon dating and pollen analysis research (which I believe was originally done for her 1983 PhD thesis) was undertaken in only 3 of these corries. She also specifically mentions Garbh Choire Mor of Braeriach (which contains the largest and longest-lasting perennial snowfields in the Scottish mountains, and which contains a moraine at a higher altitude than the other moraines in the Cairngorms) in the 1990 SMC journal article, singling out its moraine as being difficult to date, although she concludes that it is likely to be younger than the other moraines that have been dated to the age of the Loch Lomond Advance of c. 10,000 years ago. Rapson points out that the David Sugden’s original lichen cover research from the 70s that prompted the theory that glaciers existed in the Cairngorms in the 17th century has not been completely negated by her later research, at least in the case of Garbh Choire Mor. She makes the tentative suggestion that ‘the coire, because of its high altitude, accommodated a true glacier during the Little Ice Age’. As I mentioned in the previous comment, there is scope for further research work in this area, and I believe the question of whether glacial ice (perhaps ‘inactive’) existed in the Cairngorm mountains in the Little Ice Age is still open. RAPSON S C. 1990. The age of the Cairngorm corrie moraines. Scottish Mountaineering Club Journal 34 (no. 181). 457–463. The original fieldwork in the corries of the Cairngorms that prompted the theory that small glaciers existed relatively recently in these corries was carried out by David Sugden of Aberdeen University Department of Geography in 1964, and is described in an article he wrote in the Cairngorm Club Journal, volume 97 (1977), titled ‘Did glaciers form in the Cairngorms in the 17th-19th centuries?’. Sugden’s analysis of his fieldwork results took the form of dating of Rhizocarpon Geographicum lichen (commonly known as ‘map’ lichen due to its similarity to the visual appearance of a map of countries with borders separating them) growing in the corries, by measuring and comparing relative diameters of lichens – a technique known as lichenometry. This research is nearly half a century old now, so it is definitely time for an updated program of work to resolve the question of whether glaciers existed in any of these corries as recently as the period of the Little Ice Age. In the comment above from March 18th, I questioned the validity of the assumption made in Sheila Rapson’s later research that glaciers always remove all traces of any organic material beneath them – in Sugden’s 1977 article, interestingly he comments ‘there are numerous situations in the world where glaciers have crossed weak deposits such as peat without removing them’. In his recently published book (A snow book, northern Scotland, Paragon Publishing, 2011, Pg. 67), Adam Watson suggests that the ‘moraine’ at the foot of Garbh Choire Mòr, mentioned by Sheila Rapson in her SMC Journal article of 1990 is probably not a moraine formed by a glaicer, but instead is a protalus rampart. This would explain the relatively recent date of formation, and would not require the existence of glacial ice to form, instead being formed by rockfall from cliffs onto a large snowpatch at the foot of Garbh Choire Mòr. This effectively means that current expert opinion is now firmly weighted against the existence of any glacial ice in the Cairngorms since the last ice age. Actually in the past few years there has been more snow than the Met Office predicted, and in Feb 2014 massive flooding of southern England. A solid month of rainy weather which so far is the fourth highest ever, and at the apparent peak of a cycle of such conditions, occurring on a decadal timescale. It wasn’t unexpected, considering that a major perturbation of the Jetstream was known about some 12 months before hand. Yet the crazy Met Office prediction in November 2013 was that, “This Winter will be likely be drier than average”, due to Man-Made Global Warming/Climate Change,Weirding, or Disruption. (and Uncle Tom Cobbley & All ?). Alternative forecasters stated that this was wrong, but yet Dame Slingo, the UK Met Office Chief propagandist, is saying that this is because they need a bigger & better computer, with a bigger and better software and of course this will cost millions, and require dozens more staff to operate, and so on. Why should we give these charlatans a penny ? You may not get the climate you like or want, at any one place at any time. This is a fact. You may live in a place where it often was sunny, and then it becomes often rainy, or vice versa. Too bad, that’s life. The Climate is a chaotic system, and it has swings and roundabouts. Miniscule changes in amounts of what is a rare trace gas in the atmosphere, do not change the climate to such extreme degrees. The climate can change all by itself, as it has done for billions of years, long before man set foot on this planet. The Butterfly effect or Lorenz effect of chaos theory, combined with Solar variability, is a good enough explanation to account for all the recent changes we have seen without any input from Humans. Virtually nobody is “denying climate change”, and the phraseology is disingenuously used, for bogus and fraudulent reasons, which are many and varied, but always to extract moneys from the Government, and ultimately the people. People like you and me. The Webmaster does not necessarily agree with all the content of every video at the site, and the main criteria for inclusion, is that they should offer a credible, contrary view, or impart some esoteric knowledge, or are just plain interesting and thought provoking. Controversy exposes the Bull$h’t and like Fox News, We Show you the evidence, and then YOU Decide. These videos may disturb and shock you, be warned. Some videos may disappear from time to time, as hosts may be taken down. That’s life, but the Webmaster will try to provide something alternative and interesting for you instead. Whew that was longer than I meant it to be, thanks for reading thus far.